Note: These have been discontinued. Newer models with added features and higher performance were recently reviewed. Learn more. In case you haven't noticed, there's been some bad news the past few years for chronic scofflaws. The MPH BEE III radar's POP mode has proven capable of outwitting most radar detectors, and the Spectre radar detector detector this year can ferret out the few models that it couldn't last year. To learn which models can meet all of these threats we purchased anonymously five units and spent several months evaluating them. Here's what we found. The BEL Vector 995 replaces the best-selling 985 model, one of the perennial top-rated detectors in our tests. The Vector 995 has digital voice alerts and a digital display, making threat identification a simple task. Aside from the features common to high-end BEL models -- settings memory, auto mute, tutorial mode and multiple programmable options, among others -- the BEL Vector 995 also has the unique Tech Mode. This displays the radar's frequency, crucial information for techno-geeks since it can tip you to whether the source is a Safeway door opener or real police radar. Also unique among this group, the BEL Vector 995 offers Ku band detection, making it suitable for international travel. Selectable band defeat allows the disabling of any frequency not used in a particular state or country, X band for instance, to limit false alarms. And there's a soft carry case included for travel duty. The Vector 995 can be linked to the Beltronics (BEL) LaserPro LP 905 laser shifter system and, once connected with the single wire, it controls the BEL Laser Pro LP 905 and its display depicts threats and system status. As in the top-of-the-line BEL Pro RX65 model, the BEL Vector 995 offers three city modes to limit urban false alarms plus Highway for maximum sensitivity and AutoScan, which lets the detector adjust sensitivity automatically to suit ambient conditions. The latter is good enough at optimizing sensitivity while eliminating false alarms that most will use it exclusively. The standard display spells out the frequency -- X, K or Ka, or laser -- and conveys signal strength with a bar graph. Among the seven user-programmable options is Voltage Meter, which displays vehicle system voltage. As we accidentally discovered, this can be an invaluable diagnostic tool if your car's alternator is beginning to wilt. The BEL Vector 995 detects POP mode radar and is VG-2-proof. But like the others, the lethal Spectre (called Stalcar outside North America) RDD, or radar detector detector, can spot it, and from a considerable distance. Programming is far more intuitive than in past models and the big, top-mounted manual mute button -- also used for menu option selection during programming -- is easy to reach, even in total darkness. The voice alerts are of excellent quality, audio volume is loud enough for use on anything short of an un-muffled Harley and the display is sufficiently intense to be seen even under difficult lighting conditions. 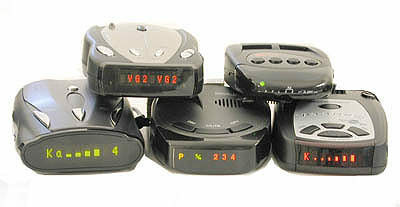 BEL radar detectors have always delivered top scores in our performance tests and the BEL Vector 995 was no exception. It led the pack in every radar sensitivity test, spotting X-, K- and all three Ka-band frequencies from up to 28,000 feet away. At the fiendishly difficult Curve Test site, against the lethal digital Ka-band radar it gave an additional 30 to 50 percent more warning distance than all but the K40 RD850 (produced by BEL for K40), which narrowly trailed it. And it led the pack in POP-mode detection as well. The Verdict: Best-performing detector on the market in the near-premium price class. The stylish case has a titanium-colored upper section punctuated by long chrome buttons and has a black lower body. A large digital display dominates the front. The chrome buttons reflect badly in the windshield but you'll be forced to keep it well within your line of sight for the yellow text display to remain visible. In direct sunlight it tends to disappear. Audible band ID is handled by no fewer than 11 different alerts for radar and lasers. VG-2 and Spectre get one apiece, And there are three Safety Alert (safety radar) messages and another for Strobe Alert. There is an equal number of visual alerts, including four for lasers alone. But you're more likely to get a call from a sober Brittney Spears, inviting you over for filet mignon and Moet et Chandon, than to ever encounter a Safety Alert transmitter, those three alerts are dispensable. So are three of the four laser alerts—unless you demand to know that you've just been nailed by a Kustom Signals ProLaser III instead of an LTI UltraLyte LR 200 -- as you reach for license and registration. Unlike the BEL, there's no tutorial mode to cycle through the alerts to learn them all. With 11 all told, you'd go bonkers having to listen to the endless array during automatic self-test at every power-up. Instead, the Cobra just gives a double-beep confirmation tone and the voice announces "System Ready." That's the downside to 11 alerts rather than one each for the three radar bands and one more for laser, all that's really needed. The Cobra XRS 9700 has three city modes including X-band shutoff. IntelliMute silences the alerts below a set engine rpm to help keep things quiet in slow city traffic. X-band sensitivity is dramatically less than previous high-end Cobras, probably sacrificed in the quest for better Ka-band range, but it also helps limit X-band falses. That's a very acceptable compromise -- provided you don't live in a state where X-band radar is used. Radar sensitivity was well above average, trailing the leading BEL Vector 995 only at the difficult Curve test where the XRS 9700 had the least range of the group. Against Ka band radar it proved incapable of delivering enough warning to slow down before getting tagged by the radar. The Cobra's POP mode performance was dismal. At 1500 feet it had a 20 percent success rate in detecting the MPH BEE III radar. At 4500 feet it scored 30 percent, too low to be of value unless you're having a sensationally lucky day. It also proved to be nearly deaf to radar coming from behind with 311 feet of Ka-band range versus the BEL 995's 4950 feet. It was equally hopeless in spotting Cobra's own Safety Alert transmitter, only belatedly sounding an alarm when our emergency vehicle had closed to within a scant 51 feet. The Verdict: great styling, much improved on Ka-band but user-unfriendly alert system and some large gaps in the performance envelope. Compared to the stylish Cobra and to a lesser extent the BEL (Beltronics) Vector 995 and Whistler DE 1793, K40's only dash-mount model looks a bit dated, more a contemporary of the competing Rocky Mountain Radar RMR-D550 than the others. Features include auto mute, settings memory, dim/dark and city/highway modes, not much to boast about for a model this pricey. The status LED is pale green. Visual band ID is handled by red and amber LEDs for X and K, respectively. Both light to indicate Ka band. Green and amber are lousy colors to use on a piece of gear mounted on a dash and true to form, on the K40 RD850 both disappear in sunlight. A dedicated Ka-band LED would be nice, particularly in light of the fact that X-band signals today are nearly always generated by door openers or other radar detectors, not police radar. Combining X and K LEDs to indicate Ka band is an early nineties design practice, adopted when dual-band detectors were being hurriedly converted to tri-bands capable of catching a third frequency, the then-new Ka-band. On an expensive model today it looks positively Stone Age. The visual band ID could be forgiven if the audio alerts were crisp and distinct. Unfortunately they mimic those of the company's remote models: a collection of chirps, tweets, whistles and clicks that nearly defies description. K40 says the RD850 is immune to the VG-2 -- but I found that it can't detect early model VG-2s at all, some of which remain in service. The VG-2, however, spotted it at 1,426 feet. My advice: if you drive with this one, stay out of Virginia and most of Canada -- or any area known for VG-2 use. Like the others, it's also detectable by the Spectre RDD (radar detector detector). The K40 RD850 windshield mount is, uh, unique. First the spring-clip visor mount bracket clips over the detector. Then the whole assembly slides into the back of the windshield suction-cup mount. Once assembled, the stack of parts increases the detector's overall height from slightly over one inch to nearly three, wobbling noticeably in reaction to every pavement irregularity and taking up a lot of windshield real estate in the bargain. Worse, if you try one-handed to adjust it for windshield rake, the whole assembly collapses, leaving you holding a pile of parts. In 20 years in the business I've never seen a more ineptly designed bracket. The RD850's saving grace is performance. It resists false alarms tenaciously and it ran neck-and-neck with the BEL Vector 995 in nearly every radar test. However, its laser score ranked dead last and it can't detect POP-mode radar. Like other K40 detectors this one comes with a ticket rebate guarantee. I suspect many buyers will find use for it. The Verdict: good radar performance, hardly any features, old technology, indecipherable audio, clunky mounts, poor visual displays and pricey. Competitive with 1995 models but badly outclassed by modern designs. This model marks a departure for Rocky Mountain Radar detectors: it detects some types of radar reasonably well. Their other models, all of them based on only two crude, Korean-built platforms notable solely for their extremely low cost to Rocky Mountain Radar -- about $35 -- always rank dead last in our performance tests. Most are incapable of detecting some types of radar even at point-blank range. The RMR-D550 had the fewest features of any model other than the K40 RD850: settings memory, auto mute, dim/dark mode and bilingual voice alerts. That's it. The RMR-D550 offers no text display, universal among high-end models. Instead it has the same icon display for status, band ID and signal strength you'll find on $39 K Mart specials. The yellow status light and green LED that doubles for both K and Ka band ID all wash out in sunlight, leaving the driver to rely on audible band ID alone to identify threats. As on the K40 RD850, combining the K and Ka icons is a dumb idea. We're a lot more interested in knowing about Ka-band radar than K-band and barely concerned about X band at all. A dedicated Ka-band icon would eliminate the guessing. The RMR-D550's audible alerts are reasonably distinct but can barely be heard at highway speeds. A cranked-up sound system easily swamps its audio. The RMR-D550 tied with the Cobra for last-place on X and K bands at the Curve Test site but ranked second to the leading BEL on Ka band. Laser scores were mid-pack. Its POP mode performance was wildly uneven. It spotted the MPH BEE III 70 percent of the time at the 4500-foot mark but only 10 percent at a no-brainer 1500 feet, exactly the opposite of what I'd expect. And there's a downside to its hot Ka-band and POP detection capability: more false alarms than Chicken Little. A companion RMR-D450 model is identical in appearance but promises to jam radar and laser as well. But, having been the first to alert the world to Rocky Mountain Radar's jammer scam over a decade ago ["The Little Jammer That Couldn't", Automobile magazine, June 1993], and having tested all of RMR's magic boxes since, I can verify that none of their wares has the ability to jam anything. They do, however, generate enormous profits for their retailers. The Verdict: Good Ka-band sensitivity, mediocre X and K; few features, erratic performance and wildly overpriced. A $40 detector masquerading as a $299 model. My advice: look elsewhere. The Whistler 1793SE has a stylish black housing with the upper case a bright aluminum color. Its red text display depicts operating mode, band ID, signal strength and SWS messages. Display brightness can be adjusted in two steps from full bright to dim to almost dark. In the latter mode only the mode text -- Highway or City -- is illuminated. Radar band is spelled out by red text. Radar signal strength is shown numerically, 1 through 9 along with a bar graph. VG-2 encounters are spelled out as well although the 1793 didn't spot our early model VG-2 until it had closed to within 1086 feet, some 1780 feet after the VG-2 had detected it. Like the K40 RD850, this isn't a detector for use in a no-detector area. Audible band ID is excellent with each band easy to identify. Three different sets of audio helps tailor the tones to one's preferences. Standard features include auto mute, manual mute, settings memory, SWS reception, alternate City modes and Battery Saver. Five user-selectable options are provided: VG-2 detection, Battery Saver on/off, tutorial mode, display mode (compass, radar or both), a silent self-test at startup and alternate audio tones. Programming is far from intuitive; don't leave home without the manual. There are four operating modes: Highway, City, City 1 and City 2. Highway acts conventionally, City raises the audible alert threshold while City 1 reduces X-band sensitivity and City 2 shuts it off entirely. Like its siblings, this Whistler's bright upper case and chrome buttons produce noticeable windshield glare during daylight. The Whistler 1793 showed excellent radar performance and its laser sensitivity was the best of the bunch. At 1500 feet its 60 percent POP mode detection success was second only to the BEL's 90 percent. But at the 4500-foot mark that number dropped to 25 percent. And it falsed a fair number of times on both K and Ka while in POP mode. The Verdict: The Whistler 1793 is a reasonably well designed, competent radar detector. It has excellent audio, generally very good radar- and laser sensitivity and has a full portfolio of features.